A unique dossier of hundreds of pages for The Jacksons An American Dream A substantial archive of hundreds of pages of documentation relating to the production of the ABC series broadcast in November 1992. 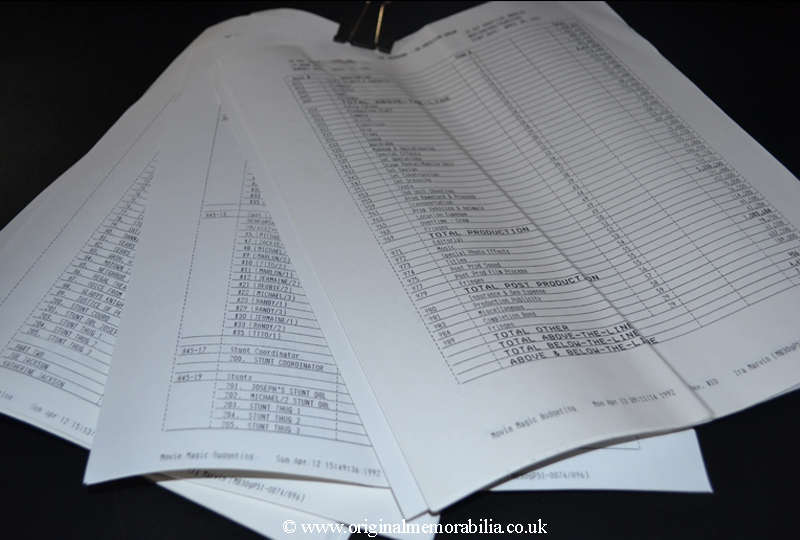 A substantial archive of hundreds of pages of documentation relating to the production of the ABC series broadcast in November 1992. 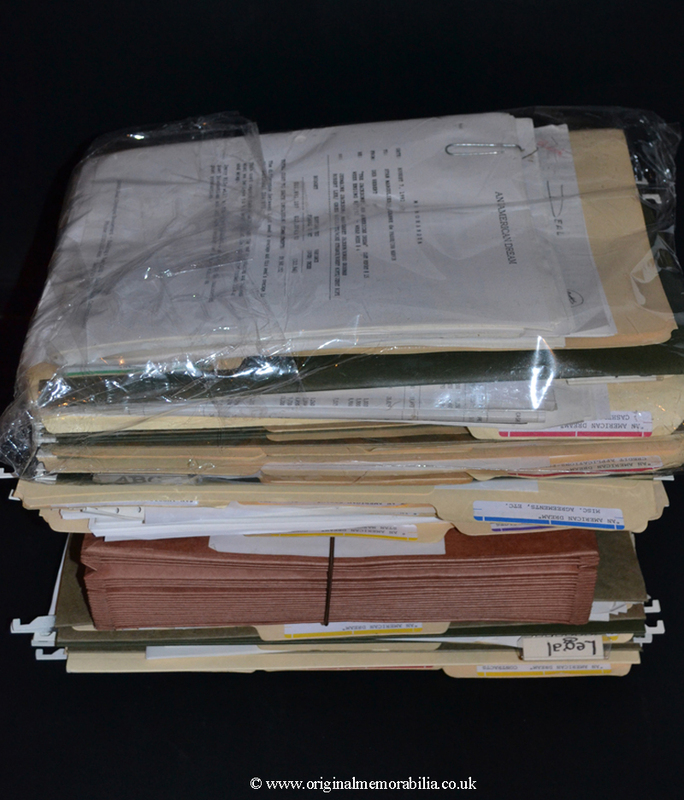 Size (approximate): Hundreds of pages, mostly A4 - 297mm x 210mm (11.6 x8.2"), some smaller. 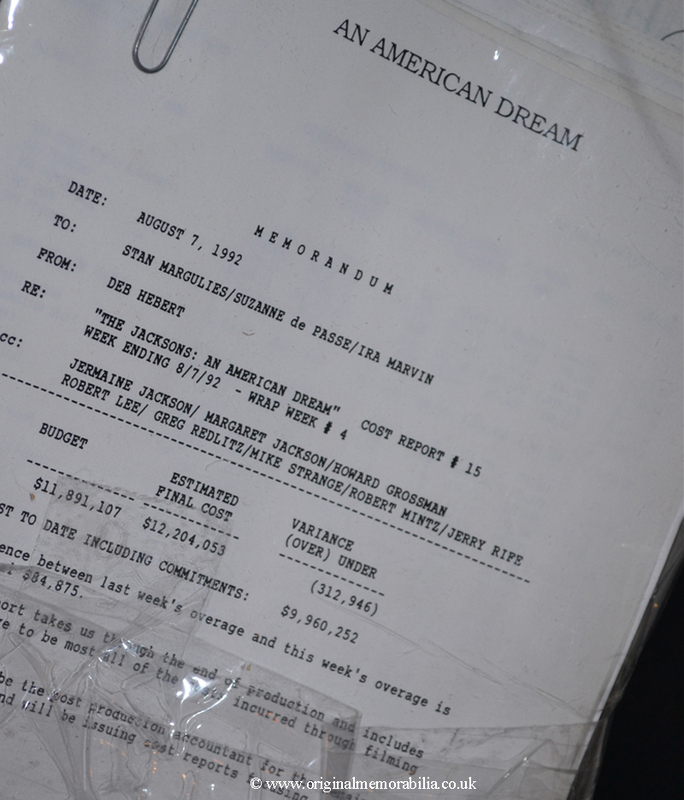 A substantial archive of original and file copies of internal documentation totalling hundreds of pages relating to the production of the ABC series broadcast in November 1992 The Jacksons An American Dream. This sale provides an unprecedented insight into the production of the authorised story of the Jackson family jointly produced by Jermaine Jackson. 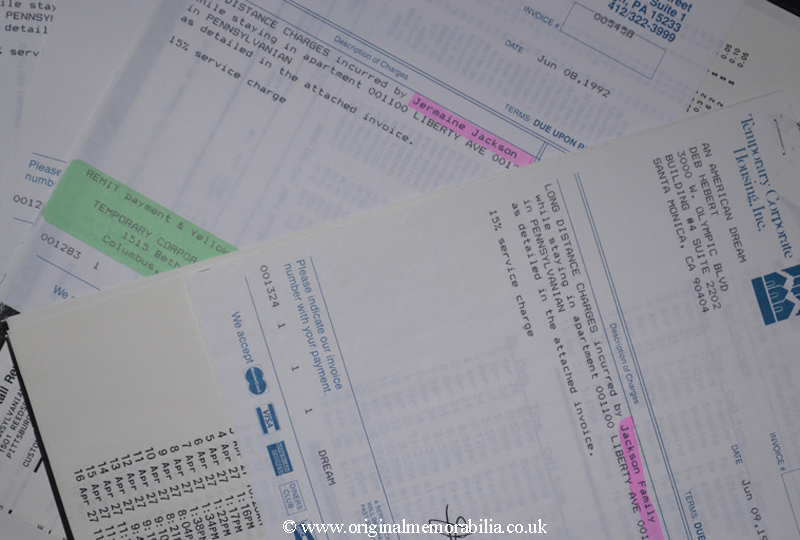 This lot contains, but is not limited to internal and external correspondence, proposals, memorandums, facsimiles, meeting notes, financial documentation, detailed financial shooting budgets (60 page), contracts, telephone bills, invoices and handwritten notes. Some documents are annotated with handwritten comments. 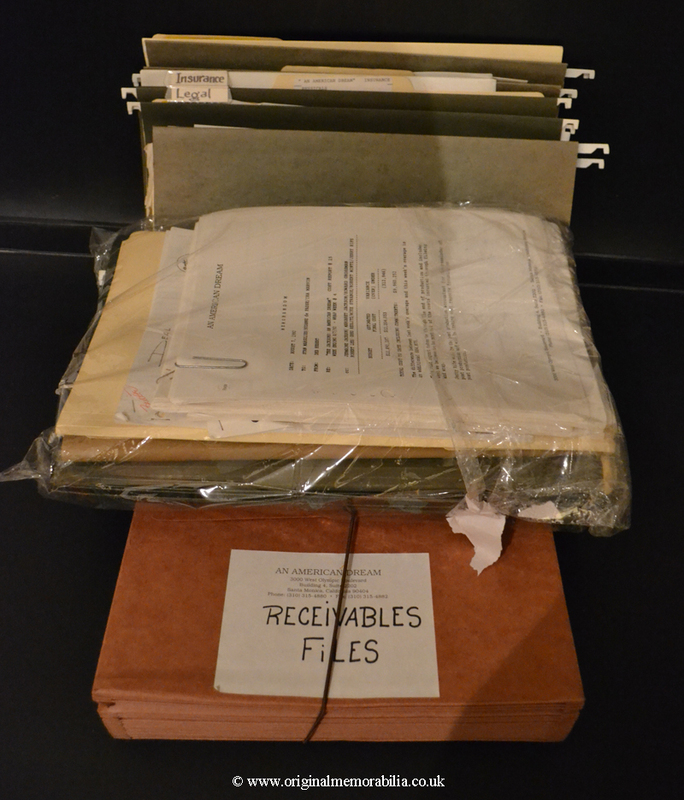 All supplied in the original files. A genuine Aladdins cave of unique Jackson memorabilia with significant investment potential. Because of the size and the substantial weight of this lot special delivery arrangements will need to made and additional delivery charges will apply. Please contact sales@originalmemorabilia.co.uk for precise costs to your location. This lot is guaranteed to be one of a number of unique items of ephemera and memorabilia from the Jackson family estate including items of stage wear and business related files and ephemera from Joe Jackson Productions Inc. dating back to the 70's, 80's and 90's. Every item is guaranteed to have been stored by the Jackson family and many have been hidden away for decades. 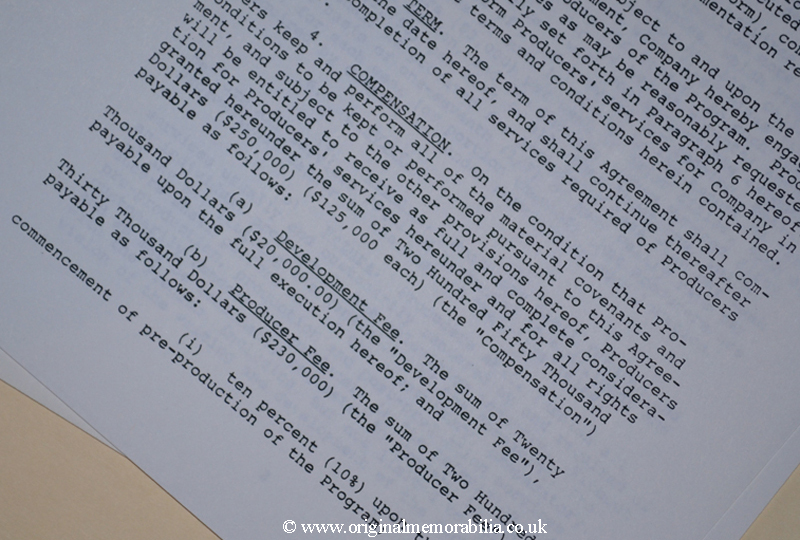 Each item provides a unique insight into this fascinating family and provides the collector and investor with an opportunity to own a very individual piece of entertainment history. Your purchase is safeguarded by our unique Document of Ownership & Certificate of Authenticity that is provided with every purchase which will describe in detail the provenance relating to this piece. See 'Authenticity' for further information.